Jim Webb Exits Democratic Primary, Leaves Door Open For Independent Bid : It's All Politics The former Virginia senator decries the extremes to which both parties have moved and says he will consider running as an independent, where more people identify. 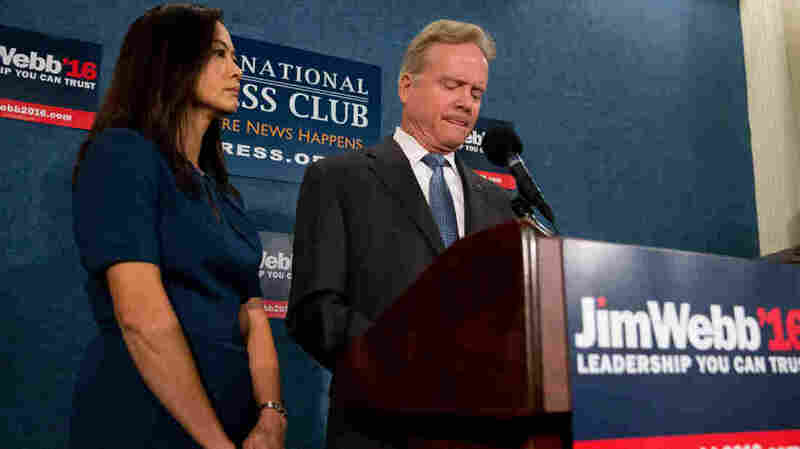 Former Virginia Sen. Jim Webb, accompanied by his wife, Hong Le Webb, announces he will drop out of the Democratic race for president during a news conference at the National Press Club in Washington on Tuesday. Jim Webb ended his Democratic campaign for president on Tuesday, leaving open the possibility he could still run as an independent. Decrying how far both parties had moved from the center, the former Virginia senator acknowledged that there was no path forward for him in the current 2016 field. "I fully accept that my views on many issues are not compatible with the power structure and base of the Democratic Party," Webb said in an afternoon press conference at the National Press Club. "For this reason I am withdrawing from any consideration of being the Democratic Party's nominee for the presidency." Saying he is still considering an independent run, though — for which he said he was confident he could get more support than he did in his quest for the Democratic nomination — Webb pointed to an increasingly disillusioned middle in the country that is hungry for a different kind of candidate. "Poll after poll shows that a strong plurality of Americans is neither Republican nor Democrat. Overwhelmingly they're independents," Webb said. "Our political candidates are being pulled to the extremes. They are increasingly out of step with the people they are supposed to serve." As a Democrat, though, Webb never caught fire in the primary, running a shoestring campaign that was unable to compete with higher-profile candidates like former Secretary of State Hillary Clinton and Vermont Sen. Bernie Sanders. In last week's debate, Webb spent much of his time complaining he wasn't getting enough time (something lampooned this past weekend by actor Alec Baldwin on Saturday Night Live). Webb's efforts at a White House run were, at best, meager. He only made nine trips to Iowa, one to New Hampshire and three to South Carolina, according to the National Journal. Last quarter, Webb raised less than $700,000 and was averaging about 1 percent in national polling. The moderate Democrat and former Republican, who served as Navy secretary under Ronald Reagan, was increasingly out of step with the national party. That was clearly on display in last week's debate. He's more conservative than other Democrats on gun rights, environmental issues and affirmative action. Positions like that, and his background as a decorated Vietnam combat veteran, helped him to win in Virginia, now a swing state that was more conservative a decade ago. He rode anti-war sentiment and the backlash against George W. Bush's Iraq policy to a narrow victory in 2006, helping give Democrats a Senate majority. But Webb often seemed disillusioned with Congress and announced he wouldn't seek a second term in 2010. He had remained mostly out of the political spotlight since, until late last year when he announced he was forming an exploratory committee for president; he made his bid official in July. Webb did bring military experience to the Democratic slate and was the only combat veteran running in either party. A graduate of the Naval Academy, Webb was a rifle platoon commander during the Vietnam War and was awarded the Navy Cross, the Silver Star Medal, two Bronze Star Medals and two Purple Hearts. In addition to his later service in the Defense Department, Webb was an accomplished journalist and novelist. He won an Emmy in 1983 for a report on the Lebanese civil war for PBS NewsHour and has also written 10 books. Webb isn't completely out of the 2016 mix just yet. He said he is still considering an independent bid for president. "How I remain as a voice will depend on the kind of support I'm shown," said Webb. "Though I'm not going away; I'm thinking about all my options." That would be an uphill climb for the underfunded former senator. Raising money to fuel a run is only half the problem; getting on the ballot in all 50 states would be an expensive proposition. He should not be completely discounted, however. Webb's home state is Virginia — especially crucial in recent presidential elections — and if he peels off even a small percentage of the vote, that could be a problem for Democrats. As for whether Webb still considers himself a Democrat, Webb paused and told a reporter, "We'll think about that."